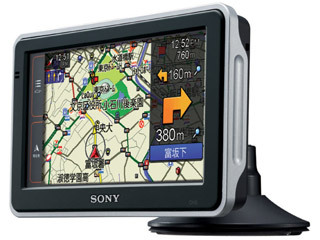 Sony has just announced a new PND (Personal Navigation Device) to fit the GPS (Global Positioning System) segment for Japan market. The new model, known as NV-U2 is the successor of NV-U1 with quite some significant features improvement over its previous version. Not only with some improvement of its outlook, but more importantly, it has an embedded gyro sensor that is able to provide the most accurate GPS location based on the rotational angle measurement. As compared to NV-U1, the newly released model has a larger 4.8 inch display panel, with similar resolution of 480 X 272. While the LCD touch screen getting bigger, the actual size of end product is able slim down with total weight of 250 gram only. Internally, it consists of a 2GB flash memory for multimedia storage. Besides, there are some feature enhancements and most notable one would be the new gyro sensor that is able to give the user best location accuracy even when the GPS reception at the area is not good. If you are GPS device user, you may experience the track lost when driving in the tunnel or under flyover. All these can be improved by having the tiny module in place. The new PND is expected to be launched by end of this year in Japan market at a selling price of USD510.